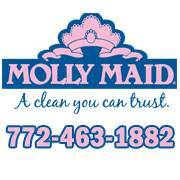 Molly Maid is a clean that you can trust! We send a team of two fully trained, insured, and bonded home service professionals. They arrive in marked car wearing uniforms and bringing with then their own equipment and supplies. We recognize that every customer has different needs when it comes to cleaning their home. That is why at Molly Maid we provide a FREE in-home estimate. We GUARANTEE our work.